Most of the world knows by now that J.K Rowling has been revealed as the author of The Cuckoo's Calling, but under the pseudonym 'Robert Galbraith'. Apparently the pseudonym roughly translates to 'Famous stranger' in Gaelic, but I can't confirm that as I don't speak the language. 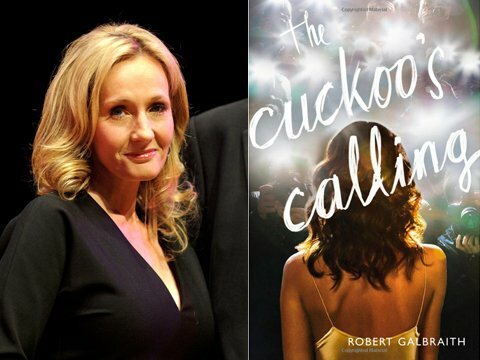 Rowling decided to write the novel under the disguise of a debut author Robert Galbraith to see what the response would be like to a first time author with the writing ability of one of the most famous authors in the world such as herself. Her real identity was only disclosed to a tiny amount of people, including those who worked at the legal firm Russells. Chris Gossage who worked at Russells is said to have told his wife's best friend, Judith Callegari, that Galbraith was really Rowling. The company stated that it was revealed "during a private conversation". They then added "the disclosure was made in confidence to someone he trusted". Shortly after Gossage told Callegari the secret, she revealed Rowling's identity to a Sunday Times journalist on Twitter on July 9th. Russells continued: "On becoming aware of the circumstances, we immediately notified J.K Rowling's agent." The book had sold just 1,500 copies before Rowling was revealed as the author, but it rose more than 5,000 places to top Amazon's sales list within hours after she was revealed. Rowling found writing under a pseudonym "a liberating experience" and she had "hoped to keep this secret a little longer" but later added it had "been wonderful to publish without hype or expectation, and pure pleasure to get feedback under a different name." However, she also said "I feel very angry that my trust turned out to be misplaced. To say that I am disappointed is an understatement." Rowling has been writing successful books for years. Of course, this includes the prestigious Harry Potter series and also The Casual Vacancy. With each book she wrote came hype, expectation and - if the book wasn't a new Harry Potter book - disappointment from fans. So it is understandable that she wanted to experiment and see what it would be like to be a first-time author again. I feel really sorry for her that the secret was revealed at all, never mind so soon. I did wonder if the whole 'reveal' was part of a marketing plan, but Russells have stated: "We can confirm that this leak was not part of any marketing plan and that neither J.K Rowling, her agent nor publishers were in any way involved." Overall, I am very much on Rowling's side about all of this. I agree with you. It's such a shame that her secret was discovered. I'm intrigued by The Cuckoo's Calling, and I will probably check it out. I was a little disappointed by The Casual Vacancy, so I'm hoping I enjoy it! I completely agree with you Amber. It's a real shame the secret wasn't kept longer, being in JKR position being able to write something without any pressure from the publishers or fans must have been liberating. On the other hand the figures kind of speak for themselves and it just goes to show how important a name is in an authors career. I agree that the figures show how important a name is in an author's career. It's a shame, because I'm sure there are a few authors out there who can write better than the average author but their name not being well known could probably jeopardize their career...if that makes sense. *shrugs* Thanks Jesse! I'm on Rowling's side too! It must have been great for her to be able to publish a book without Harry Potter being there as a standard for her to meet. My mum has ordered The Cuckoo's Calling so I think I'm just going to nick it once she has read it hehe! I actually really loved what she did here. She definitely showed how tough it is for a first-time author, selling only 1500 books in the first few months. I also think that, with her hidden identity, she was able to get truthful comments. And people wouldn't be comparing her novels to anything, and nothing can ever live up to Harry Potter in fans eyes. I think J.K. had the right reasons to do this, and that the breach of her privacy in many ways is wrong. She has as much right as anyone to that. Gasps!! HOW DARE HE REVEAL HER SECRET! This man should be er ... FIRED! n'stuff. AND WHO EVER THAT MAN'S WIFE'S FRIEND WAS, (JUDITH) SHE SHOULD.. ER.. FACE THE NATURAL CONCEQUENCES OF HER ACTIONS. What do you think? Forgot to add, agree with you comoletely. I also feel very sorry for JK Rowling. It must have been really nice to feel what it's like being a new author who is selling books not because of who she is, but because of the quality of the writing. Whoever spread her secret should feel ashamed, as it was probably really exciting writing as Robert Galbraith, and now that name has been taken away from her. I completely agree. But who knows, maybe she'll try the whole pseudonym thing again...?